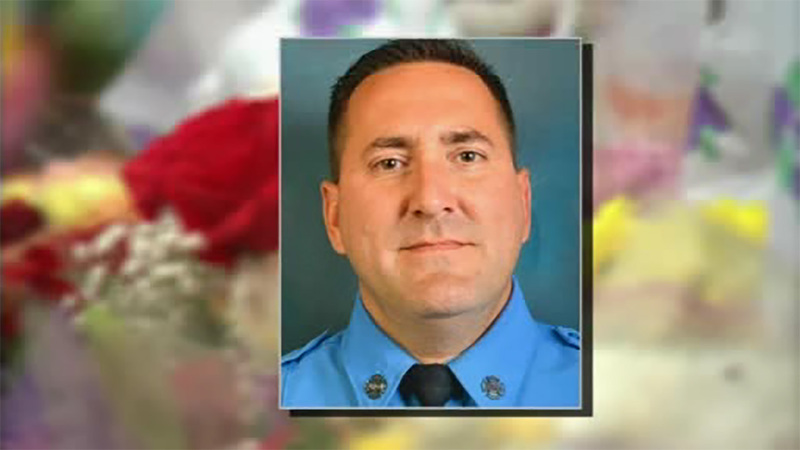 BETHPAGE, Long Island (WABC) -- Family, friends and colleagues turned out by the hundreds Tuesday to mourn fallen FDNY firefighter William Tolley, who fell to his death while battling a fire in Queens last week, at the first of three wakes. Investigators continue to look into what went wrong that caused the 14-year veteran to fall five stories to his death in Ridgewood. A large memorial for the 42-year-old at Ladder 135 continues to grow, and on Monday, the Stephen Siller Tunnel to Towers Foundation announced it will pay for the mortgage on the Tolley's home. Fighting back tears, wife Marie Tolley spoke publicly for the first time at the ceremony. With her 8-year-old daughter Bella by her side, she expressed her gratitude for the gesture, and for the continued support from the FDNY and the city. "We just want to say thank you from the bottom of our hearts," she said tearfully. "And to the firefighters here that worked with Billy, and everyone in the fire department that has been with us every second. I know Billy would be so grateful and proud because he loved this job." The wake will be held at Chapey and Sons Funeral Home, located at 20 Hicksville Road in Bethpage, from 2 p.m. to 4 p.m. and 7 p.m. to 9 p.m. Wednesday. Funeral services will be held at St. Martin of Tours, located at 220 Central Avenue in Bethpage, on Thursday April 27, at 11 a.m. In lieu of flowers, the family requests donations be made to the "William N. Tolley's Children's Educational Fund" at FDNYfoundation.org/donate.